So mommy to be is expecting a cute little baby daughter. We all know that girls just want to have fun and that is why we put together some really interesting girl baby shower games. Bring excitement to a whole other level for mommy and friends with these game ideas and activities. Feel free to use elements of pink and lavender in games and prizes to compliment this gender themed party. We love the tray game and so we decided to add some Pinkalicious-ness (our special word for it) in celebration of our theme. To prepare you will need to buy some small items for the baby and yes they have to all be pink. 8 to 10 items will do, such as socks, shirt, rag, bottle, rattle, pacifier, a toy, onesie, booties, etc. You can even add more than one type of item, for instance 2 pacifiers or 2 rattles. This will really show up those who were really paying attention. On the day of the party place them on a regular serving tray. Place the tray with the items on a table where it can be viewed by everyone. This way it can be easily mistaken for table decoration. "The Mommy-To-Be is Having A Gorgeous Baby Girl"
We love Bingo and your guests will too. Print a free version of this game for each player and hand them out with a pencil. How fast can each of your guests fill in some unique names for each letter of the alphabet. Really competitive and may give mommy a few more names to add to list of possible baby names. 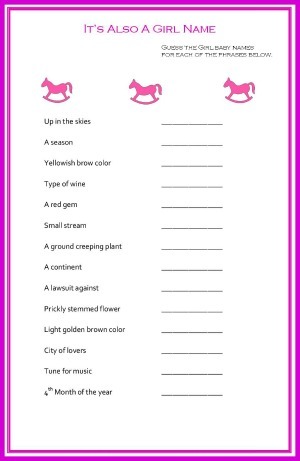 To play just print a copy of this free printable A to Z game sheet and place the timer for 1 to 2 minutes give each person a game sheet and let the race begin. If mommy prefers not to have games then a nice activity could be making hair bows and hair clips for the little princess, after-all which mother doesn't like to adorn their baby's head with pretty bows and clips. Gather supplies before party and place them all on a table with a little sign with a sort of mini tutorial to help guests along. If you can try to have a variety of items so the ladies can creative. They can make head bands, hear clip and hair bows or even decorate little baby hats. Another fantastic idea is to make advice card for baby. As women we need to pass on our sage advice weather it be recipes for her to try out with mommy or general advice about life and love. Mom-to-be is expecting the perfect pair. In honor of her twins we thought we will help with some ideas for girl twin games. The aim of this game is to find a matching pair to the item as quickly as the player can identify them. Pairing up baby socks is a funny shower game many enjoy but you do not have to limit yourself to only socks.